GAME FREAK developed this absolutely hideous blocky thing for Nintendo Switch and mobile devices, called Pokémon Quest. GAME FREAK doesn't usually, if ever, directly develop Pokémon spin-offs. Until now. ...And to me, it's pretty clear that they shouldn't be developing this. Just a reminder that, when GAME FREAK's smaller, more junior teams develop games, they end up developing excellent titles like Pocket Card Jockey. If they worked on this self-evident disaster, then that means we'll be deprived of their true potential. Pokémon Quest is a free-to-play game featuring simple controls and only the original Kanto Pokémon. It's supposedly a “rambunctious action-adventure RPG” that features you collecting (and buying) “power stones” to make Pokémon more powerful. You collect loot, and you go clear waves of enemy Pokémon, perhaps similarly to Pokémon Rumble. Unlike Pokémon Rumble, you're not going out into the field by yourself, but you have AI-only-controlled friends to make things easier. You also collect ingredients to try to lure new Pokémon to your area. 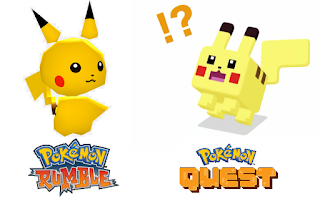 Unlike, say, the deformed art style of Pokémon Rumble, Pokémon Quest doesn't try to make its victims look good. The game is actually out on the Nintendo Switch eShop right now. I haven't gone and played it because Rawk claimed this would be a better article if I didn't. Whatever. This game has no silver lining to it and we should immediately forget it exists. These games infuriate me for... so many reasons. But let's start with a description: Pokémon: Let's Go, Pikachu! and Pokémon: Let's Go, Eevee! (which will collectively be known in this article as Pokémon: Let's Go) are also being developed by Game Freak resources. They are directed by Junichi Masuda. You could describe them as Pokémon GO from your house, but instead of walking around the real world with augmented-reality Pokémon, you are walking around a recreation of the Kanto region. The game is either a remake of, based on, or inspired by Pokémon Yellow. Do you know how Pokémon GO initially only had Kanto Pokémon? The original 151? Just like Pokémon Quest. They have been releasing subsequent generations of Pokémon, which many millions of people probably thought were original and made just for Pokémon GO. Remember, 800 million downloads. They don't know what's going on. They have a Poké Ball Plus peripheral, which is very similar to the Pokémon GO Plus dongle that I don't think anyone actually purchased. (In fact, you can use it as just that.) This allows for connectivity with Pokémon GO — you can transfer your Kanto-only Pokémon from GO to Let's Go. No word on the other way around. It also does some other weird stuff, to be revealed. Let's talk about Poké Balls in general. There is a “new way” to catch Pokémon, controlled by motion gestures. There are no wild Pokémon battles in Pokémon: Let's Go. You just throw a Poké Ball to catch a Pokémon, which is apparently just like Pokémon GO. They call this an “evolution” in how you interact with wild Pokémon. “Great! !” they try to convince us. But it's not. You may remember that the number one rule drilled into a real Pokémon fan's head for how to capture a wild Pokémon is that you need to weaken it by lowering its hit points and inflicting a status condition. These range from the Pokémon catching tutorials in every main series RPG, to Ash Ketchum's Pokédex berating him in the very first episode of the anime for attempting to catch a Pidgey with a Poké Ball without battling it first. Interestingly, throwing a Poké Ball at a Pidgey without battling it first is EXACTLY what Junichi Masuda now considers an evolution in the franchise. Pokémon: Let's Go is abandoning Pokémon's cardinal rules to try to weave GO players into the fanbase. What does that mean for the existing games? How can Masuda shamelessly stand there and say the game is inspired by Pokémon Yellow and the anime when it abandons its most fundamental truths? Pokémon: Let's Go also features local multiplayer two-player co-operative gameplay. 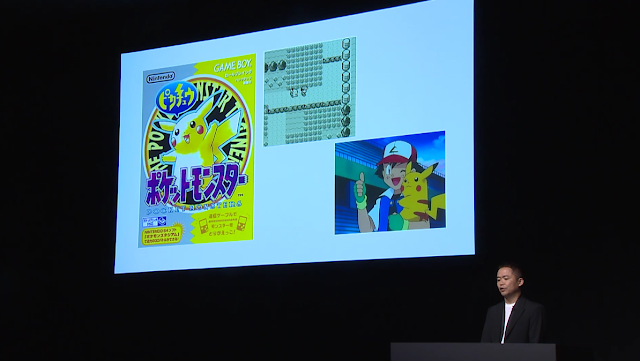 Masuda described how, when Pokémon games were on Nintendo's handheld devices, each player had their own handheld system and their own copy of the game. In a direct contradiction of Nintendo's stated corporate wishes of having every family member own their own Nintendo Switch device with their own games, Junichi Masuda discusses how the Nintendo Switch Joy-Con allow for multiple people to share the same experience with one Nintendo Switch and one game card. Horrifyingly enough, you can just spawn an entire human just by shaking the second Joy-Con, very similar to how people just warp into the scene in Pokémon Sun and Pokémon Moon. This allows you to harass wild Pokémon with two sets of Poké Balls, or bully young trainers by teaming up on them. This is explicitly in the game to make it easier. I've seen a lot of people use the next heading as a defence for why I shouldn't criticise Pokémon Let's Go. They say that it's a spin-off, and I shouldn't criticise spin-offs, or something, because I'm getting the core game I want. That's ridiculous. I can criticise whatever I want. Also, the idea that Pokémon: Let's Go is a spin-off when it's a reimagining or remake or whatever is ridiculous. Never before in the history of the game industry has a remake of a main series game been classified as a spin-off instead of a core remake, to be held to the standards that remakes are held to. If you can think of a counter-example, go ahead and give me one in the comments section. It's being sold for $60 on November 16, 2018, in a worldwide release. You know, like a main series game. “The Core 2019 Game” is all we know about it, other than “2019” being “second half 2019.” We know core is defined as a game akin to Pokémon X, Pokémon Y, and Sun and Moon. That's good. We also know that GAME FREAK is developing this as well, which makes me wonder how stretched their resources are if they are developing every game in this article. But what if they keep pandering to people who are only familiar with Kanto Pokémon, like they did with Alola? That's main series. That definitely played to the GO crowd. 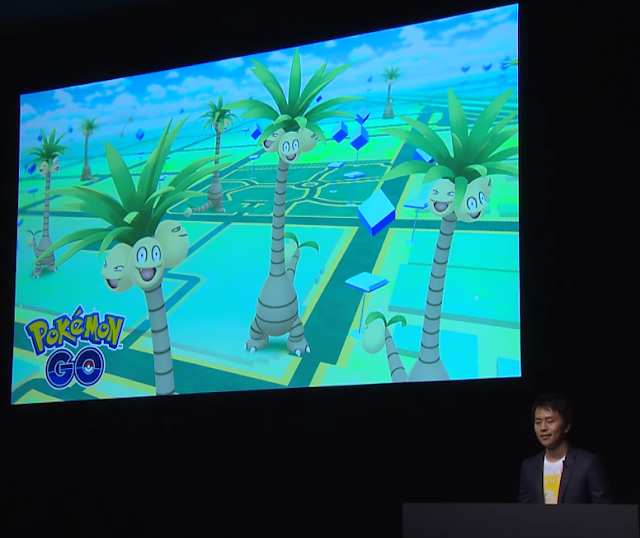 They specifically will allow you to transfer Alolan Exeggutor from Pokémon GO to Pokémon: Let's Go, even though you can't find it in Kanto. The Pokémon Company knows they have a huge potential for wealth if they get a bigger fraction of those 800 million Pokémon GO players nurtured into real Pokémon fans playing (or, more importantly, buying) real Pokémon games with real mechanics, not dumbed down stuff. They need to delicately put out content with a clear line from GO to core RPG. Pokémon: Let's Go is supposed to be a middle point there, but it might not be the only middle point. What we know as the “core” may have to compromise as well. Move the goal post to make the nurture easier. Maybe we'll never be able to battle a wild Pokémon ever again, since the concept is unheard of for Pokémon GO players. In yesterday's article, I wrote about the concept of fatigue. To review, if you release too many titles in a short period of time that people can't absorb them all, they'll stop following every release and churn away. Sometimes... forever. With all of these Pokémon titles being released in close proximity to one another and to their predecessors (it's basically been an annualised series for a while), how much risk does Pokémon have of fatigue? I have a novel theory: The risk is lower than that of franchises like Super Mario or Star Wars. (The ones discussed in the article.) Why? Progress transferability (backwards compatibility). In the core RPG series, if you try hard enough, you can get Pokémon from 2003's Pokémon Ruby and Pokémon Sapphire for the Game Boy Advance onto the latest titles for the Nintendo 3DS. It's convoluted and complicated right now, but possible. GAME FREAK's decades-long dedication for backwards compatibility has enabled consumers to not feel like they are constantly dropping everything and moving to the next game. They know how to play the long game. Rather than several disjointed gameplay experiences in a short time, a player may choose to have one ultimately continuous experience. This dramatically reduces the pain of there being new games, which function more like expansion packs in this point of view. This is why they have Ash be the protagonist of the anime series for decades. Ash has one continuous journey, and he is allowed to do things like visit old regions, meet old companions, and get old Pokémon from Professor Oak. (Or have them obnoxiously show up and steal the show if they're Charizard.) He might not always do that, but the option is always available and it's sometimes exercised. Transferability is why you can use that Poké Ball Plus thing to move your GO dudes to Let's Go. Eventually, GAME FREAK will have to allow a merging of the so-called Go line of products with the core line of products, because maintaining two different product lines is both unsustainable and undesirable. The end goal is to get the fanbases to merge, because that's the profitable way to go. That has the side effect of trying to sell all of these mobile gamers a Nintendo Switch, which is an entirely different challenge altogether that Nintendo is trying to solve through their own mobile efforts. In the meantime, the fanbases will continue to hate one another. If GAME FREAK isn't fast or effective enough with converging the interests of Pokémon GO fans and core series fans, they might lose the GO-ers entirely as they lose interest and move onto something else. Or maybe they'll all get killed off from the dangers of the world. Ludwig has zero plans to spend any money on Pokémon Quest, and zero plans to buy Let's Go. That 2019 core Switch game, though? Yeah, there is a very large chance that will be the next Pokémon game he owns. What do you think of Ludwig's analysis? Are you excited about irrelevant things like Pokémon following you in the overworld? 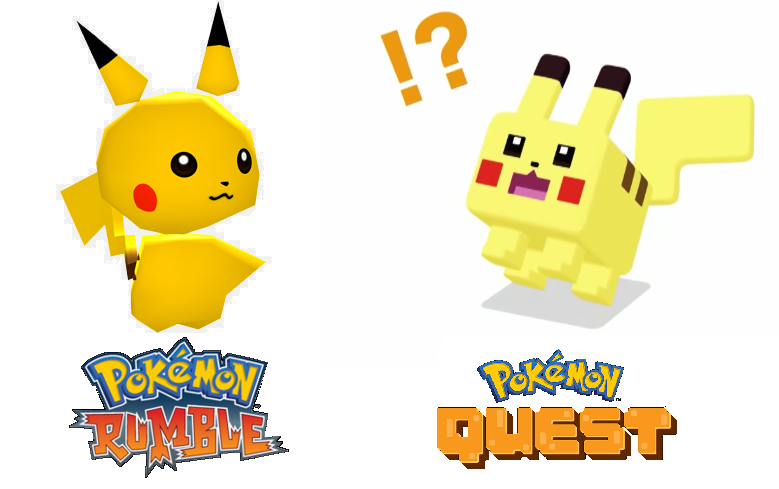 Do you like that cube design going on with Pokémon Quest? There is a lot to comment on, so let's get great discussions happening in the comments section! Ludwig similarly despised when The Pokémon Company had that Direct announcing Pokémon Ultra Sun and Pokémon Ultra Moon. Even though Ludwig is a self-admitted big supporter of the eventual existence of remakes for the Sinnoh Pokémon games, that in no way shapes his thinking of every announcement to come from The Pokémon Company. Ludwig actually really enjoyed Pokémon Rumble on the Wii, and cried for help as he found himself spending money on its free-to-play 3DS counterpart, Pokémon Rumble World. Ludwig went ahead and played Pokémon Quest, and was utterly disgusted by his experience. It's very clear that the Pokémon GO fans will be driving the interests for the entire rest of the franchise, because that is how director Junichi Masuda thinks. Ludwig got to play Pokémon: Let's Go and despises it. Does Game Freak really think the 800 million Pokémon GO players will get excited by this game? Everyone has a phone to download a free app on. Buying a whole console just to play Zelda and Mario on? Not so much. These kids play Xbox/PS4. Or PUBG/Fortnite on their computer. Furthermore they will just dumb down their franchise by removing battling (remember Pokemon GO has no EVs, IVs or abilities etc). Do they think veteran pokemon players will get excited at the idea of waving their arm around to catch wild Pokémon? Game Freak thinks a percentage of the 800 million Pokémon GO players who are not already main series fans will get excited by Let's Go. A large percentage will not, but the percentage who will is still a big opportunity, even if it's a couple of %. According to my research (there are several IV calculators on the Internet for GO if you do a search), Pokémon GO Pokémon do have IVs — so there is some basis of being able to eventually transfer them somehow to a converged main series game in the future. Sort of like how transferring a Pokémon from the Virtual Console's emulations of RBY on the 3DS works. Game Freak is primarily pitching Let's Go for the GO players. ("New players" they say.) Any additional lines they say after that ("Veterans will enjoy a fresh experience as well!") is just empty talk because it doesn't cost anything to at least go out and say that. But the game will be designed with GO players in mind to try to nudge them towards the main series. You touched on the biggest flaw here — Will smartphone gamers buy a Nintendo Switch just to play Let's Go? No. That's the same issue that Nintendo itself is running into with its own line of mobile games. But they'll keep committing to it. I have my doubts how much it'll work. It is great that KoopaTV kept me grounded in reality. I was excited about Go Pikachu/Eevee until KoopaTv pointed out the actual flaws of the games and how boring they will be. Besides I see no giraffe Pokémon anywhere. Sounds like a Kody B. comment until the last sentence. But yeah, if you are not in Generation 1, the fanbase that GAME FREAK wishes to cater to does not care about your existence. Sorry, Girafarig. 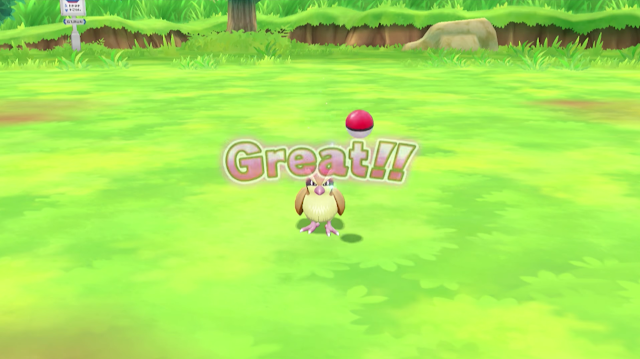 I don't think I was actually hard enough on Let's Go in this article. I held a lot back. How ironic that the most exciting Pokémon news now is the recently dumped 1997 Space World Pokémon Gold ROM which is a gen 2 game. Girafarig is probably the most talked about Pokémon from that demo now because of its earlier concept sprite. I know why you care, but we've known about Girafarig's design for many years now. Though, not those evil tail things. That's new. We never saw the back sprite before though. It is great that KoopaTV kept me grounded in reality. I was excited about Go Pikachu/Eevee until KoopaTv pointed out the actual flaws of the games and how boring they will be. Besides I see no giraffe Pokémon anywhere. You both get glare-y points for not capitalising the V in KoopaTV. The first time around it was done.
" I was excited about Go Pikachu/Eevee until KoopaTv pointed out the actual flaws of the games and how boring they will be." Y'all need to be CONSISTENTLY... perfect, especially when y'all have the gall to demand perfection of me with the Corrections Corner. I was talking about this sentence: "It is great that KoopaTV kept me grounded in reality." I won't correct anymore if that is what you want. I know you are, which is why I said y'all need to be consistent, and I'm talking about the second sentence. I do like having perfectly-written content; I don't like if the quest for perfection gets in the way of having good discussions. I can't edit comments here. I either have to live with it, post an additional comment about the error or delete and rewrite. I don't like clogging up with extra comments about errors so I rarely do it and I feel deleting comments and reposting will be too much work for you guys. I'm not just glaring at you, but at Kody for replicating it. In any case, no one has anything to say about my excellent analysis on how fatigue factors into the Pokémon franchise?